Childcare available for children ages 4 and younger. Click here for the worship bulletin. 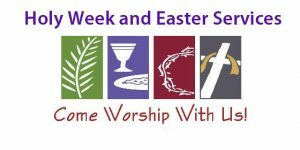 Hearty Easter Potluck Breakfast in Fellowship Hall at 9:00 a.m.
Worship with Communion at 10:30 a.m.